Practice standing while riding: Most beginners feel more comfortable riding while seated, but learning to ride in a neutral standing position will improve your riding exponentially. Known as the attack position, your body weight is centrally located on the bike, head up, knees slightly bent, elbows raised and in line with your wrists, gripping the bike comfortably with your knees and with firm, but light pressure on the grips. Your head should be about even with the handlebars so you would be able to look down on the number plate. Riding in this central position enables the bike to "pivot" beneath you, offering better control, and enabling your body to react to unforeseen situations. Try to get into the habit of having one, two, or even three fingers on the clutch and brake levers in order to make shifting and braking quick and seamless. Foot positioning: Riding on the balls of your feet allows for better access and control of the shifter and rear brake pedal. It's also the widest part of the foot which makes it able to bear the most weight for longer periods. 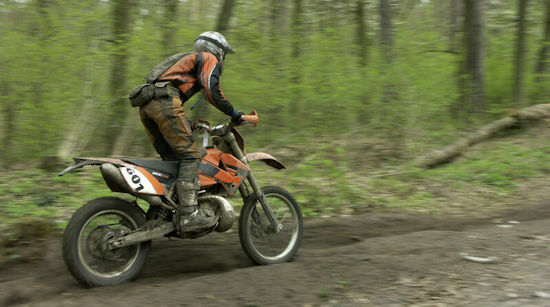 Turning: Piloting a dirt bike is more a matter of weight transition than an actual turning of the handlebars. Press the bars rather than turning them, and use your body weight to help balance the bike through a turn instead of steering the bike through the turn. Riding a dirt bike is much more about your legs and body weight than your arms. 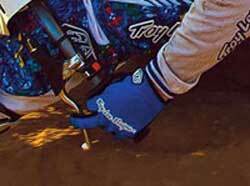 Brakes: Braking is another key component of riding a dirt bike well. There's no need to stomp or grab the brakes. Today's bikes are very sensitive to the touch and you want to learn to apply both brakes evenly. Grabbing too much front brake can cause an endo, and applying too much rear brake can cause the rear tire to wash out. Strive for steady and even pressure. When riding a four stroke, you'll also be able to utilize engine braking once you gain a bit more experience and get to know your bike better. Head's up: One of the most important aspects of becoming a faster, better, and safer rider is learning to look ahead. Keeping your head up sounds simple, but it's a very difficult skill for beginners to master. Your body will follow your eyes, so if you keep looking at that big rock you're afraid of hitting, you're going to hit it without a doubt. Train yourself to scan the horizon because the farther ahead you look, the more time you will have to react to an unsafe or difficult condition. Keeping your eyes up is one of the best ways to improve safety and increase speed. You can't go very fast if you're wrapped around a tree trunk. Visualization: Try to visualize your body on the bike. Watching the pros on televison or video is a good way to get a picture in your mind's eye. If possible, get someone to take a short video so you can see what you actually look like when on the bike. It's also a great way to compare how you're progressing as a rider with a before and after presentation. Practice, practice, practice: Practice drills can be boring, but try to choose one drill and practice it for at least ten or fifteen minutes before starting to play ride. Concentrate on getting the techniques right rather than focusing on speed. If you get the technique right, the speed will come naturally and you'll be much faster in the long run, not to mention much safer.